For those of you who are moving house in the near future you might think that all your worries are just going to be concerning the logistics of the move itself but, unfortunately, that isn’t the case. When people move from one address to another, it offers criminals the perfect opportunity to steal your ‘identity’ if you’ve not taken the proper precautions. Identity theft is big business for the criminal fraternity and, if you’re not careful, it can be used to obtain false passports in your name and can also be used to get hold of loans and credit cards which are then utilised to run up huge debts. Here are some precautions you should always take when you change your address to minimise the risk of becoming a victim of identity theft. 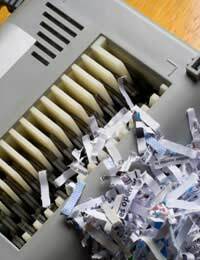 You should ensure that you shred and get rid of any paper documentation that has details of your name at your old address and may give some clues to potential criminals of your financial matters. Don’t just throw them away in the bin. Criminals can take advantage of being made aware of someone who’s about to relocate and can use it as an opportunity to rifle through your bins after you’ve departed from where they can retrieve all sorts of sensitive information about you which might be used to commit identity theft. Even things like old catalogues and brochures which you’ve received over the years but might have never bought anything from for some time can be used as part of an identity theft crime. And, whilst you’ll no doubt have notified all of the major companies and organisations such as your utility companies and banks and credit card companies of your change of address, there’s a good chance you’ll have forgotten about mailers and catalogues or simply can’t remember all of those you’ve signed up to receive literature from at one time or another. To avoid these kinds of things still being delivered to your old address after you move, it’s a good idea to sign up for the Royal Mail’s mail forwarding service as, for a relatively small fee, they’ll be able to intercept any mail that would be destined for your previous address and re-direct it to your new one. By utilising this service for, perhaps, a year (you can sign up for up to 2 years), this will ensure that all types of mailers (and any other correspondence for that matter) will be delivered to your new address from where you can always cancel any unwanted catalogues by contacting the companies directly as and when you receive information from them. You should also sign up for the Mailing Preference Service (MPS) which can be done free of charge. This will allow you to remove your name at your old address for any future direct marketing mail which you might end up being sent, although it will not prevent existing mailers from being delivered so you’d still need to contact these companies if you wanted your name either removed from their mailing list, inform the companies of your new address or use the Royal Mail forwarding service. Make sure you get in touch with your local authority to register your new address on the electoral roll and, if you are relocating away from the area, you’ll also need to contact your previous local authority to get de-registered from your old address.Check Your Credit ReportA criminal is most likely to want to steal your identity to take out loans or credit in your name so you should check your credit report every few months or so to ensure that no applications which you were unaware of have been made in your name. If you suspect they have been, then you should inform the police. Criminals will always come up with devious ways of finding out your e-mail address and/or telephone number at your new address so be very wary of phishing e-mails or any phone calls which ask you for security related information. Quite often, if you’ve left behind a paper trail instead of shredding documents, criminals can use that to pose as ‘legitimate’ representatives of companies you actually do use and may contact you to ask you to update your details. They should never ask you over the phone for any passwords or to log on directly to an account from an e-mail they send. If you are in any doubt, simply ignore the e-mails and log on to any accounts online via the company’s own secure website and if it’s a phone call, simply ask them for their phone number, verify the number belongs to the company and then call them back. Many of us use social networking sites on the internet these days to keep in touch with friends and make new contacts but be very careful about the information you put on your profiles on these websites. Criminals do target them and you’d be amazed how many people give away their date of birth and even their mobile and home phone numbers on their profiles, all of which can be valuable information for a criminal intent on stealing your identity. By taking these precautions and treating any suspicious activity with caution, you’ll minimise the risk of becoming a victim of identity theft.